geoLOGIC basinINTEL powered by BetaZi - A revolutionary software that provides accurate, pre-computed probabilistic well production forecasts for western Canada - geoLOGIC systems ltd.
geoLOGIC basinINTEL — powered by BetaZiTM is here! Maximize production, make sound acquisition decisions and increase profits with this revolutionary software. basinINTEL is the only software in Canada using BetaZi’s well production forecasts for Canadian wells. Spend less time forecasting, more time analyzing! geoLOGIC basinINTEL -- powered by BetaZiTM provides pre-computed, data-driven, accurate, unbiased and repeatable well production forecasts for every well in western Canada. 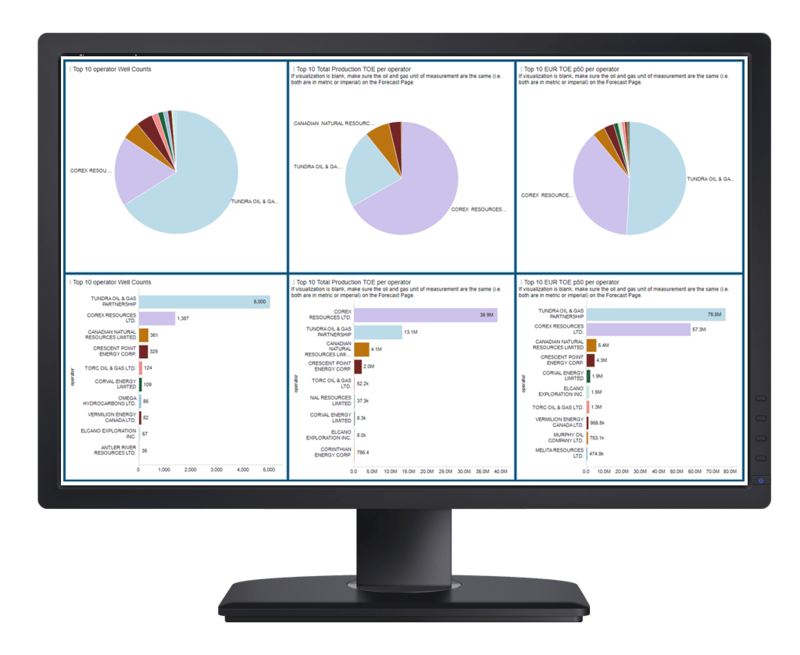 With its ability to quickly deliver up thousands of well production forecasts, you can make better and more informed decisions to improve stakeholder communication, better allocate resources and mitigate risk. 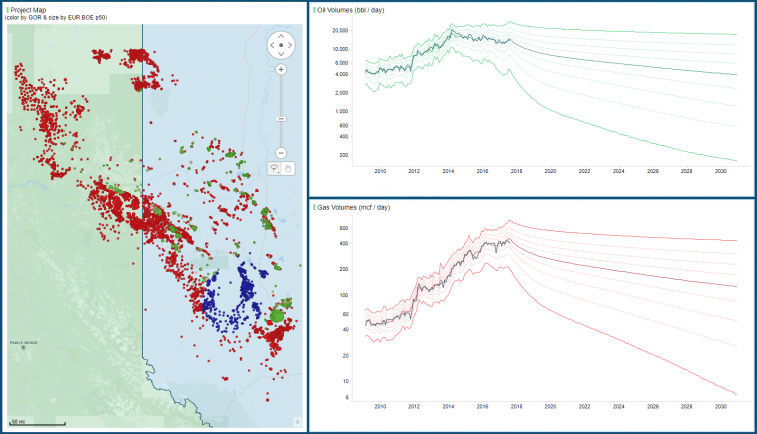 The technology behind geoLOGIC basinINTEL combines geoLOGIC’s premium oil and gas data and the BetaZiTM algorithm, which uses physics-based predictive analytics to provide highly accurate, unbiased well production forecasts in seconds. Accurately benchmark results and assess risk using true productivity metrics. Compare and contrast potential opportunities, at any level of granularity. Generate Estimated Ultimate Recoveries (EURs) in a consistent and repeatable manner, year after year. Assess well performance to identify treatment candidates and evaluate optimization opportunities. Derived from first principles using geoLOGIC’s premium production data and BetaZi’s unique physio-statistical algorithm that is trained on 4 million wells. Completely automated and unbiased, with calibrated uncertainty. Extremely accurate, back-tested and independently verified. All encompassing – the BetaZiTM well production forecasts model computes a million samples per well to account for all possible scenarios. Forecast. Roll up. Compare. Drill down. Cross-plot. Export. geoLOGIC basinINTEL — powered by BetaZiTM is delivered and updated monthly as a series of interactive Spotfire projects including full export capabilities and the platform’s familiar flexibility. You can generate custom maps and graphs for more powerful analyses and visualization. The software includes 30-year EUR figures and 30-year forecasts for every well in western Canada. The BetaZiTM model computes in a fully-automatic, consistent and repeatable manner, making basinINTEL a game-changing software for Canadian oil and gas professionals, bankers, and investors. No one but geoLOGIC can offer well production forecasts based on premium, high quality oil and gas data and the BetaZiTM algorithm on Canadian wells. Download our brochure to learn more about predictive analytics with geoLOGIC basinINTEL — powered by BetaZiTM. Find out how basinINTEL uses geoLOGIC’s premium data and BetaZi’s science to generate repeatable, data-driven, accurate and unbiased well production forecasts for every well in western Canada. Download the white paper authored by Dr. Heidi Anderson Kuzma, BetaZi LLC. BetaZi’s well production forecasting model computes a MILLION samples per well before running statistics to generate truly meaningful p-values. With geoLOGIC’s premium quality oil and gas data and BetaZi’s well production forecasts at your fingertips, this revolutionary software will truly change how you do business. You have to see it to believe it, so book a live demo with our product experts today. Ready to purchase? We are ready to work with you to get this one of a kind premium quality oil and gas data and well production forecasts software on your computer today. Connect directly with our sales team at sales@geologic.com, 403.262.1992. Founded in 1983, geoLOGIC systems ltd. is an industry leading oil & gas information provider based out of Alberta, Canada. We deliver premium data, innovative software and integrated analytics. We’re continuously evolving to deliver an exceptional customer experience. Since 2012, BetaZiTM has been vetting its new science and providing meaningful intelligence to producers and financiers from its research base in California, USA. BetaZiTM creates state-of the art production forecasting solutions for the oil & gas industry. For more information, visit www.betazi.com.